At Canon, we think that doing social activities and contributing to the community is one of our major responsibilities and concerns, in line with the Canon corporate philosophy pursued by Kyosei: “Live and work together for the common good of the community ". 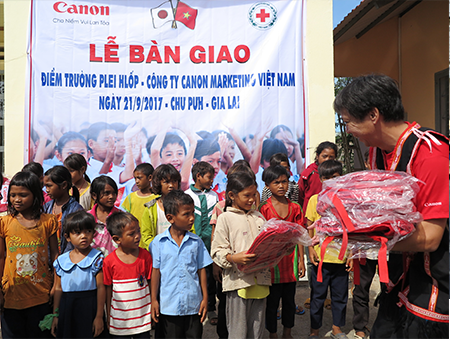 Therefore, Canon actively create and participate in various social projects. These projects include activities aimed at the future generations of Viet Nam, the less fortunate in society, support for education as well as support environment conservation efforts. At the same time, we actively participate in many major social programs such as assisting the Red Cross to heal and help those affected by Agent Orange, assist victims of natural disasters. "Smile Surgery," program to bring back the smiles to children, sponsoring the programs of voluntary eye surgery of doctors Hattori to bring back the light to the poor blind, building 100 gratitude houses as special gifts to present to Vietnamese hero mothers. 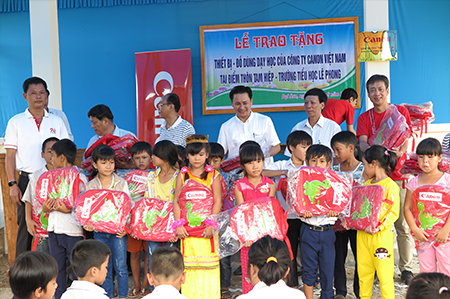 Always keeping in our heart the responsibility for the next generation as well as for the long-term commitment for Vietnamese education, Canon devotes a lot of effort to implement the project "Canon - For the next generation" since 2009. This social program aims towards a develop education in Vietnam that will provide better learning for poor and disadvantaged students by improving their learning environment. This is a well-intentioned effort, beneficial to people and society, along with the business mission. 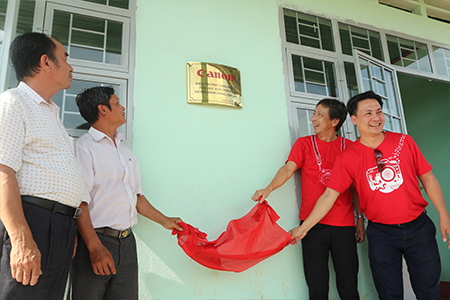 During 8 years with non-stop activities, Canon is proud of having built many new classrooms, bringing a new, modern and more comfortable learning environment for students in 57 disadvantaged schools across the country. Thousands of scholarships, financial aid have helped children continuing to pursue their studies and dreams. The total value is up to over 5 billion. (Figures up to 2017). For Canon projects supported and contributed to the development of education in Vietnam, in 2008 and 2009, Canon was awarded the merit "For the development of education in Vietnam" by the Minister of Education and Training. In 2010, with the concerns about various environmental issues and impacts of global climate change, Canon officially co-operates with the Vietnam Ministry of Natural Resources and Environment to implement a new project named "Canon - For a Green Vietnam" to contribute to global environment protection. This is a comprehensive project implemented by many aspects and many different methods to protect the environment and raise the sense of environment protection among the community. The programs in the year-long implemented "Canon - For a green Vietnam" include forest plantation projects in Thanh Hoa, Bac Giang and Yen Bai, recycling programs for industrial products, project “One photo an action" calling on the whole society to push back the problem of environmental pollution, the annual program" Earth Hour" in parallel with the classes for for students about awareness of environmental protection. Canon Group Products sold in Vietnam market complies with Circular 16/VBHN-BCT dated April 25, 2014 of the Ministry of Industry & Trade stipulating temporarily the permissible content limitation of some toxic chemicals in the electronic, electrical products.